This past weekend my family and I went on another spontaneous little trip to check off a must-see here in Colorado. 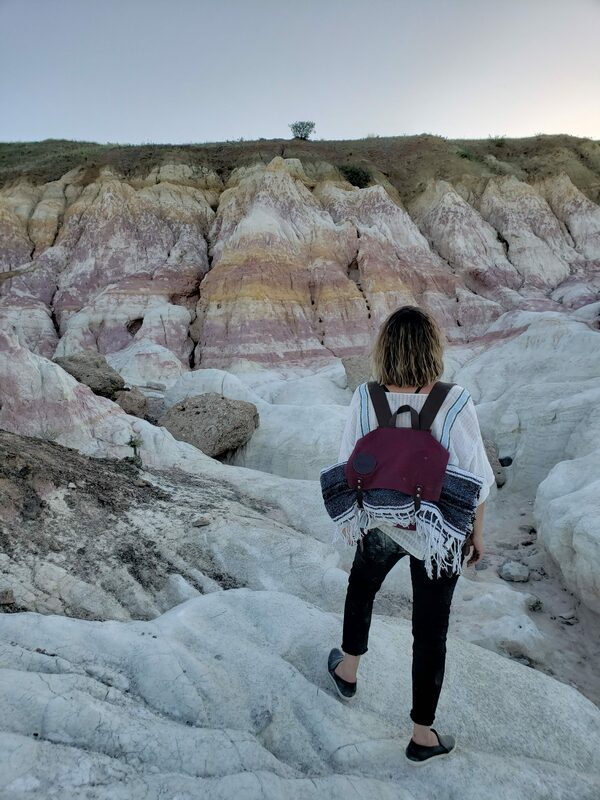 The Paint Mines in Colorado are truly a hidden gem in this beautiful state we are lucky to call home. This family-friendly destination in El Paso County is just two hours from Denver and a beautiful well-worth-it drive. The Paint Mines are named for their colorful clays that were collected by American Indians to make paint to decorate their pottery. Brightly colored bands, caused by oxidized iron compounds, are found in varying amounts throughout the many different layers of clay. You will see breath-taking purple, yellow, and orange clay that look like God just took a paintbrush to this open space. If you are looking for a hot meal on your way, head to Bino’s Pizza in Kiowa for the best meat lovers calzone you will ever have. We went on a Saturday evening, arriving around 6:30 PM. There were only a handful of people there and with the temperature dropping, this hike was much more enjoyable. You walk for a bit on an easy trail over these grassy lands and then out of nowhere these huge rock formations appear. We did bring our bike trailer which converts to a stroller, and that was a huge lifesaver walking back to the car. Liam was so exhausted that he nearly fell asleep in the trailer. Make sure you keep to the trails with the stroller though, as this is a protected site. This trail is jogger stroller friendly ! We saw about a dozen rabbits and these beautiful little pink flowers randomly growing right from the stone! Our son snapped this one of us! Liam got his face painted like Spiderman at a Bike Derby we went to earlier that day! We found a bench and watched the sun set, snuggled together with our blanket. It was the perfect way to end our Saturday. These were perfect for the tires of our ! Nate had a on too that was super handy. If you are looking for a day trip in Colorado or a unique place to visit on your vacation, I HIGHLY recommend checking out the Paint Mines. The rock formations here called “hoodoos” are so rare that they are actually one of the three locations in the whole country! I hope this guide gave you some insight on the Paint Mines in Colorado. I know I will never forget this place and hope to visit again in the winter. I am native to Colorado and hadn’t heard of this destination. Cant wait to check it out. Thanks for posting! Not a lot of people have! It is definitely a hidden gem. Hope you get to see it soon! This looks like such a fun time. I love the pictures! I will need to add this to our vacation list! This is really cool and I would love to visit these paint mines! I’ve never heard of them but now they are going on our travel bucket list! Our 3 year goal is to move from Michigan to Colorado this is now added to my must see list when we get there. The view is so spectacular. Meatlovers sounds so yummy right now. Geez I wish I were there now. Thanks for sharing! Oh that is awesome ! There is so much to see and do here. Where in CO are you moving to ? I love visiting places with natural views and natural beauty! Your pictures of the paint mines definitely make it look like a must visit place in Colorado. Thank you! It definitely is a must-see! I’ve never been to Colorado but love being outside. Looks like we need to make a trip. This looks like such a cool place! Added to my bucket list! This is gorgeous!! Thanks for sharing! One of my favorite places in Colorado! It’s so beautiful, it’s been a while since I’ve been so it’s good to know it’s family friendly. Your outfit is super cute too! !